Although antiretroviral therapy (ART) has been highly effective at controlling HIV-1 viral loads in the bloodstream of infected individuals, the virus remains latent in infected cells and starts replicating within a couple of weeks upon termination of therapy. The discovery of CRISPR/Cas9 gene editing technology has provided renewed hope for alternative suppressive therapies and possible elimination of HIV-1 integrated proviral DNA from the genomes of infected individuals. However, even though this strategy has been somewhat successful in in vitro laboratory cell models, editing of HIV-1 DNA in cells and tissues that support viral reservoirs in vivo has been challenging. Accordingly, recent strategies have employed targeted vectors to deliver CRISPR/Cas9 complexes directly to infected subjects. c) a Cas9 effector protein. This cocktail would facilitate cleavage of integrated HIV-1 DNA on both 5’ and 3’ LTRs, resulting in the excision of a portion of each LTR and the entire HIV genome positioned between the two LTRs, corresponding to the gag-pol-env and accessory genes. The experimental design, which aimed to assess the combined ability of the individual components in this therapeutic cocktail to edit the HIV-1 genome in vitro or in vivo, was as follows. 1. In vitro HIV-1 infection of healthy human blood cells, followed by in vitro treatment with therapeutic cocktail. Blood cells isolated from healthy human subjects were infected with HIV-1 and treated with the therapeutic cocktail one week post-infection. The efficiency of excision of HIV-1 DNA was determined by sequencing the 5’ and 3’ LTR regions. There was a significant reduction (up to 65%) of HIV-1 DNA in treated cells versus non-treated control cells. 2. Engraftment of human in vitro infected HIV-1 positive cells into mice, followed by treatment with therapeutic cocktail in vivo. Human HIV-1-positive blood cells infected in vitro were injected into immunodeficient mice to generate humanized mice. One week later, the mice were treated with the therapeutic cocktail. After another week, the mice were euthanized and the efficiency of excision of HIV-1 DNA was determined. In agreement with the results obtained in step 1, there was a drastic decline in HIV-1 DNA in engrafted treated animals versus engrafted non-treated control animals. 3. Ex vivo treatment of human blood cells derived from HIV-1-positive donors, with therapeutic cocktail. Blood cells were isolated from three separate HIV-1-positive patients (patients 1-3), each of whom were on ART therapy and showed low or non-detectable virus levels. Their cells were treated with the therapeutic cocktail, and the efficiency of excision of HIV-1 DNA was determined. There was a significant decrease in the level of HIV-1 DNA (up to 68%) in treated cells versus non-treated control cells. 4. Engraftment of human blood cells from HIV-1-positive donors into mice, followed by treatment with therapeutic cocktail in vivo. Blood cells from patients 1-3 were injected into immunodeficient mice to generate humanized mice. One week later, the mice were treated with the therapeutic cocktail. Two weeks later, the mice were euthanized and the efficiency of excision of HIV-1 DNA in the blood, spleens, and various other organs was determined. The efficiency of excision observed in the blood and spleens of mice engrafted with cells from patients 1 or 2 was as high as 96% compared to that observed in the blood and spleens of non-treated control mice. In contrast, the efficiency of excision was as low as 25% in mice engrafted with cells from patient 3. 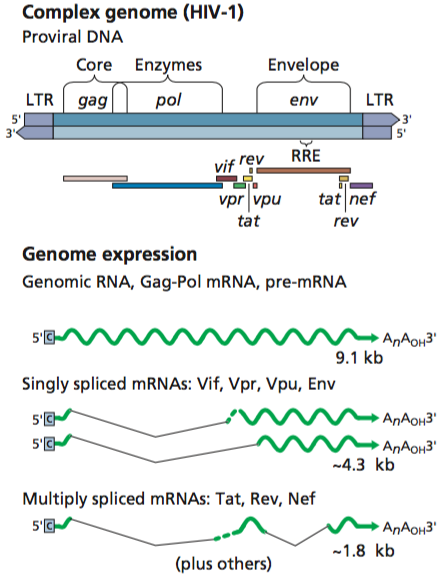 This difference in efficiency was attributed to variabilities observed in viral LTR sequences and guide RNA target sequences between different patient samples. As a further assessment of the efficacy of this therapeutic strategy, the authors isolated cells from the blood and spleen of therapeutically treated mice that were engrafted with cells from patient 1 and co-cultured these cells with a cell line that is highly permissive for HIV-1 infection. They observed significantly reduced recovery of HIV-1 from cells taken from engrafted treated animals versus engrafted non-treated animals. Although these results are promising, the system is still artificial, making it difficult to predict if it would work in humans. 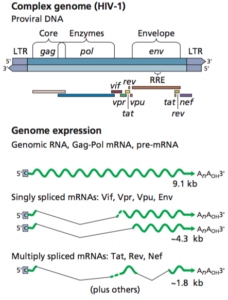 Furthermore, in vivo editing of the HIV-1 genome by CRISPR/Cas9 may not completely remove replication-competent virus from organs serving as reservoirs for viral latency, such as the spleen. As explained by John Coffin and Stephen Hughes on TWiV 510, the viral reservoir exists in a pool of infected cells that contain HIV integrated provirus. These cells are capable of clonally expanding, and surprisingly, not all offspring of a clone exhibit identical levels of viral expression. Developing effective strategies to identify and eliminate such pools of cells is a prevailing challenge in this field. Likely, complete elimination of HIV-1 by CRISPR may only be accomplished in combination with other therapies, such as ART, and may require personalized CRISPR/Cas9 complexes that are perfectly matched to a particular viral genome. Keep doing what you do. Your articles are fascinating! Countries with floating exchange rates have a bit more room for manoeuvre. Their problem (a big one in Hungary, a lesser one in Romania and Poland) is that falling exchange rates may bankrupt the firms and households which have, in past years, taken out unwise loans in foreign currencies, chiefly euros and Swiss francs. That was, in effect, a convergence play. Thank you! I’m glad somebody is reading them!